Pretty, pretty! These were almost too pretty to eat. Luckily, I got over that. As soon as I took the camera off the tripod these olive oil tea cakes were immediately devoured by Pat and I. Every. single. crumb. 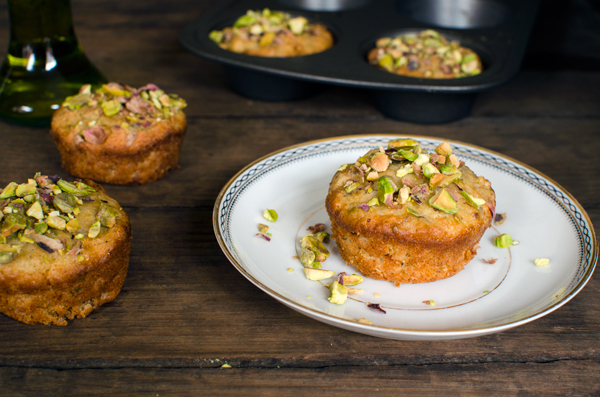 They are so easy to make, and when topped with crushed pistachios are little works of art! In this recipe, the olive oil is the star. That being said, it’s important to choose a high quality product. I love Melina’s. Their Extra Virgin Olive Oil comes from old orchards in the Kalamata region of Greece. It’s bottled in San Jose, California, which is just a hop skip and a jump away from us here in San Francisco. This recipe is originally from Farm to Table Geek’s but I came across it on the wonderful White on Rice Couple Blog. It originally called for crème fraîche but I swapped out greek yogurt, which I had on hand. Added bonus – it’s healthier! Thanks so much for reading A Side of Sweet! For more Sweet in your life,you can find me on Instagram, Pinterest, Bloglovin’, Facebook, or Twitter, or subscribe to receive a weekly email with new posts (see sidebar). Whisk together the egg yolks, sugars, salt, pepper, olive oil, yogurt, vanilla, and bitters. 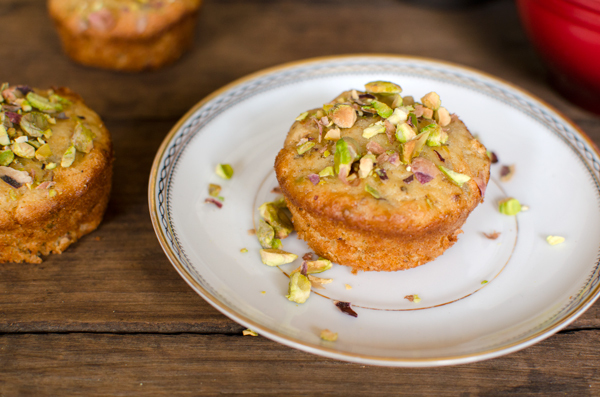 Add the pistachios and set aside. Mix together the flour and baking powder in a separate bowl. Fold into the pistachio mixture. Whisk egg whites until soft peaks form. Fold into pistachio mixture. 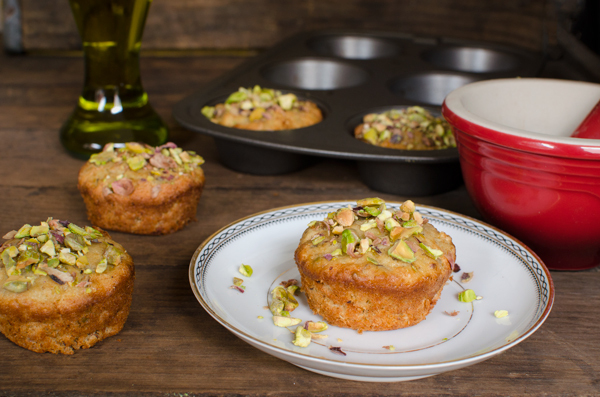 Lightly oil a 12 cup muffin tin. Divide batter among muffin cups, filling each about 2/3 full. Bake at 350F for 18 minutes until they are golden brown and a toothpick comes clean. These cupcakes are definitely pretty and I can imagine how moist it must be with the olive oil in it..
Pinning it and I follow your blog..
I’ve never used olive oil in baking but I enjoy it in a good dip or hummus. Don’t forget to leave these all in separate comments lady! I’m going to make sure you get credit for all three by commenting on this twice! 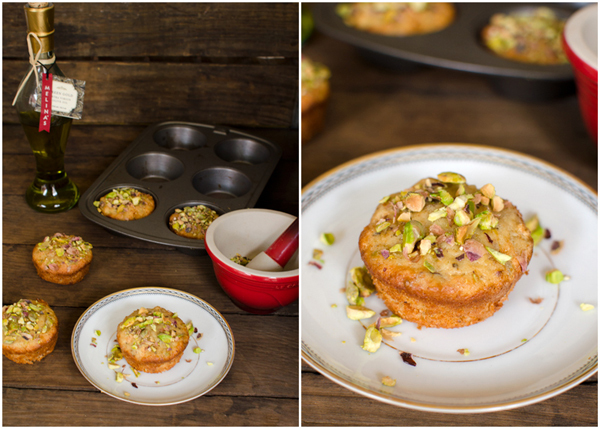 Those cakes look delicious – I love pistachios! My favorite way to use olive oil is drizzled over a melon caprese salad (chopped melon, fresh mozz balls and chopped basil). A perfect summer combo! I add salt, pepper, and a drizzle of olive oil to a boneless chicken breast, wrap it in tin foil, and bake it in the oven. This is my absolute favorite way to eat chicken. I like Melina’s on Facebook as Cindy Aiton. 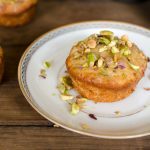 I love olive oil cake! I follow you on Bloglovin’ already! I follow you by email!!! !